It's now almost mid-July. How YOU doing? I'll tell you how I'm doing: not terrible. not perfect. somewhere between meh and pretty, pret-ty good [channeling Larry David there]. 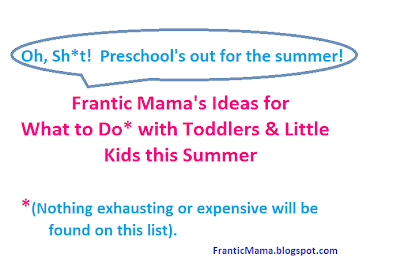 Things get easier in the summer months for work-at-home and stay-at-home parents once your kids are a little older, mainly because there's more they can do! My daughter is 4.5 and my son just turned 7 (SEVEN!). They do a morning park camp most days of the week, which is when I work, get caught up on errands, and/or catch my breath a little. The afternoons are... pretty much wide open. Which is good until it isn't. You see, I love getting outside in the summer, exploring new places, working in the yard, and doing All The Things. My kids don't always agree with me or with each other on these little adventures, and they are kids, so naturally, they get crabby, hot, hungry, tired, wet, etc. That's when Chaos Ensues. Sometimes my kids make me want to tear my hair out. The bickering, the yelling, the crying, AHHHH! I like peace and quiet, or at least laughter and joyful screaming. To cut back on the "Save me!" and support the "this is fun!" 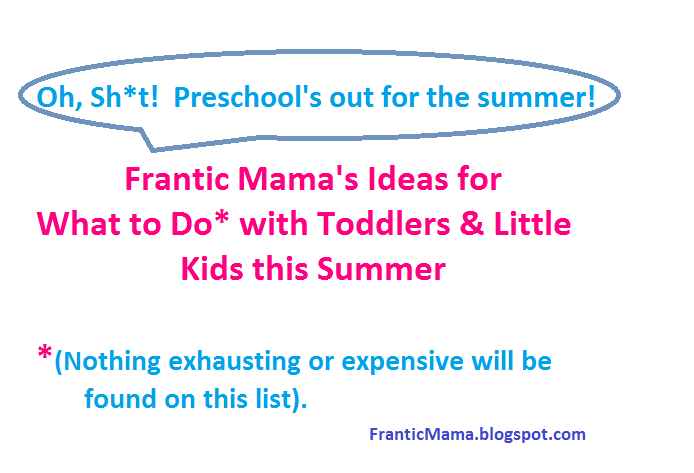 I have a few go-tos to help us get through the dog days of summer with as little pain and as much enjoyment as possible. I want to look back on these summers and remember the fun we had, not all the exhausting, annoying stuff. Who's with me? Parks. The less crowded, the better. I'm an introvert, remember? Pretty much the last thing I want to do at a park is try to carry on a conversation with another adult while also focusing on keeping my kids well-behaved with each other and all the other kids. I don't want to have to scold my kids constantly and I don't want to undergo the exhausting process of acting like every second is wonderful. I just want to sit for a few minutes and watch my kids play. Is that too much to ask? They have a ton of energy and a new playground is usually a good bet to occupy them for a while. Library visits. My kids and I don't do great on super hot, humid afternoons (we're Minnesotans!). One way to escape the heat without turning on a t.v. is to visit a library. Even better if it's a new one or a less busy one (see above). Some of the local ones offer free programs throughout the summer like magic shows and a yo-yo master (seriously). Cooking. My son has very little interest in cooking, but this is something my daughter LOVES. So I'll often pick out a simple baking recipe and let her help stir and measure. It's an activity we both enjoy, and we can do it in the comfort of our own home on a lazy afternoon. Planting fun. Growing stuff may not sound interesting to everyone, but as luck would have it, my son shares this interest with me. He especially loves learning about and watching the vegetables we plant in the spring grow throughout the summer. We often walk around the yard to inspect which plants are doing well and which ones aren't, and he likes helping water them. It's another mutually enjoyable hobby we can do in our own yard. In the meantime, let's drop the "everything is wonderful!" charade this summer, folks. Saying you had a hard day/week/summer with your kids does not mean you are a bad parent. It means you are a human one. The more open we can be with each other, the healthier and more real we'll all be. What are your summer go-tos?